Have you ever thought of recording all your telephone calls fully automatically? Maybe you have, but chances are you never found the right solution. Recording telephone calls is normal practice in many organizations, both businesses and government bodies. The conversations held with them are recorded so that there is proof of agreements reached. An oral agreement, including one made on the telephone, is legally binding. If such an agreement is later challenged, it will be difficult to find evidence. If the telephone call was recorded you will have no difficulty doing so. A recording of a telephone call is generally accepted as evidence. Thanks to this recording you will prove your case. The hard disk of a modern PC has extra space for at least 2400 hours of recorded telephone calls (10Gb), not including your own data already stored on it. A Soft Call Recorder ensures that your PC records every telephone call fully automatically. Recording your calls does not involve any action by yourself, so you can never forget to record a telephone conversation. Erasing the calls after the conversation, or at any later moment, is always possible. The software that comes with the Soft Call Recorder will automatically create a database in which all recordings can be retrieved. You can search on name, time and date, or duration of the conversation. The Soft Call Recorder has been specially designed as a less expensive alternative to the normal Call Recorder. Thanks to Vidicode's long experience with providing stand-alone Call Recorders, they are able to offer exactly those features needed to make the application of the Soft Call Recorder successful. Full automatic recording: recording is fully automatic based on detection of the hook contact or voice activation. High capacity: thanks to Vidicode's formidable compression technique, several thousand hours of telephone calls - in practice this means all your calls- can be effortlessly stored. High quality of recording: the Soft Call Recorder combines high compression with excellent sound quality. Simultaneous recording from more than one line is possible: using a standard USB hub up to six Soft Call Recorder USB can be connected to a PC, so that simultaneous recording from six telephone lines is possible. Extensive select and search function: it is easy to make selections based on, for instance, name, date or telephone number. Export and conversion routines: certain telephone calls or whole selections can be exported onto CD-ROM archive andor converted into a PC-WAVE format that can be played on any PC. Ideal for when you want to send someone a call on a floppy or as an e-mail. Presentation can be configured by the user: You can determine exactly how the software should present the data. An important function of the software supplied is combining separate archives into one via a network. This creates one centralized archive of the telephone calls of different people or from different telephones. The use of several Soft Call Recorders on one network therfore performs the same function as a centrally situated voice logged system, at very little cost. 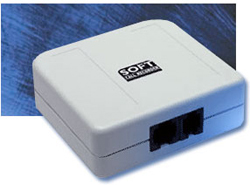 The Soft Call Recorder can be supplied in two models: The Classic, to be connected to the sound card, and the Soft Call Recorder 'USB', which does not require a sound card. This model Call Recorder is connected to one of the audio inputs of the PC sound card. Thanks to a unique detection circuit the recorder will tell the PC when the telephone rings, is taken off the hook and put back on again. When used with an analogue line it determines precisely when a call starts and when it finishes. This Soft Call Recorder does not require a USB port. It is therefore suitable for PC's and notebooks with all versions of Microsoft Windows from Win95 and later. This model is either connected directly to the USB port of the PC, or via a hub. The PC will therefore not require a sound card. The Soft Call Recorder records the sound digitally straightaway. If necessary, loudspeakers can be connected directly to the Soft Call Recorder to reproduce the sound. This Soft Call Recorder can also either be connected to the telephone receiver or to the telephone line, and detects the telephone ringing as well as it going on or off the hook to the line. Up to six of these Soft Call Recorders can be connected to one PC, with the possibility of recording simultaneously from all lines.